The ultimate race of the season is finally upon us. The 2017 NCAA Division II Cross Country Championships will be held this Saturday at Angel Mounds in Evansville, Indiana, with the women’s race beginning at 11:15 am ET and the men’s race following at 12:30 pm ET. There are a slew of solid programs that will vie for permanent glory on the winding course. Some have won titles before, and others haven’t. The one thing that every team – and individual – has in common is that they will be bringing their A-game on Saturday. Let’s take a peek at who and what to watch for this weekend. The Grizzlies are looking to reestablish its dynasty. Adams State has an incredibly solid chance to pick up its second-straight title, as well as its fifth in six years. But if the NCAA Division II South Central Regional meet was any precursor, the Grizzlies will definitely have its work cut out for them. A surging Colorado Mines team this year gave the Grizzlies a run for its money at that meet, as Adams State eked out a victory by just three points. Shortly before that race, though, the Orediggers dominated the RMAC Championships, defeating Adams State by a score of 26-80. Adams State has seen some outstanding performances from quite a few runners (more on them later), but the team was never at full strength this season, as superstar Sydney Gidabuday did not run for the squad until the South Central Regional, where he finished 19th. Should he come out and perform at the level he did a year ago when he finished fourth overall, Adams State could – for a lack of a better term – run away with this title with an outing more akin to its day at the South Central Regional than the conference championship. But definitely do not rule out Colorado Mines. The Orediggers have put together a phenomenal season, including unseating Adams State for first place in the sixth week of the USTFCCCA National Coaches’ Poll after capturing the RMAC conference title. The team boasts a deep lineup that saw all seven of its runners at the South Central Regional finish within the top-45. Also keep an eye on Grand Valley State, Chico State and Southern Indiana. 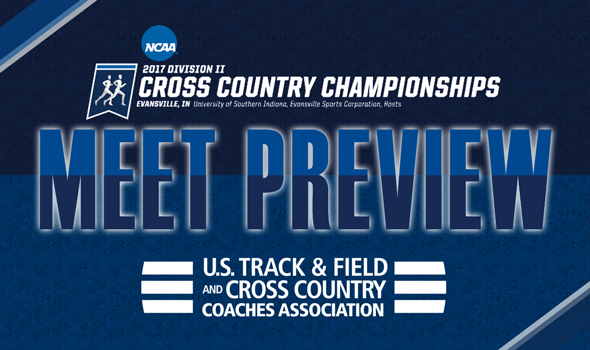 All three programs – who round out the top-five of the National Coaches’ Poll – are looking for their first-ever NCAA Division II Cross Country National Championship. All three have the firepower to cause a disturbance at the top of the leaderboard. Could we see a team win its first-ever NCAA Division II Women’s Cross Country Championship this weekend? If the USTFCCCA National Coaches’ Polls are any indication, Cal Baptist is the team to beat heading into Saturday’s competition. Having just made the full transition to the NCAA Division II level a few years ago – and ahead of a move to Division I after the 2017-18 season – the Lancers are looking to make a mark at this level while it can. Two weeks ago, Cal Baptist picked up a victory at the West Regionals against some tough competition. The Lancers have owned the top spot in the National Coaches’ Poll across the last three weeks. However, two championship regulars could make it tough for the Lancers to accomplish its goal. Grand Valley State and Adams State turned in stellar seasons, and were 1-2 in the rankings for a good chunk of the season. After Cal Baptist’s jump to from sixth to first in week five, the Lakers and Grizzlies moved to second and third, respectively, in the rankings. Despite having a slight drop in the polls, each team cruised at their respective regional meets, with all seven GVSU runners finishing in the top-24 at the Midwest Region while Adams State won with 26 points. With both of the aforementioned squads having won 13 of the last 14 NCAA Division II titles, Cal Baptist will have to fire on all cylinders in order to break up the monopoly. Alaska Anchorage, who finished a close second to Cal Baptist at the West Regionals, while U-Mary broke into the top-five of the National Coaches’ Poll this week after capturing the Central Regional team title. Look for both of those teams to make a solid push in Indiana this Saturday. This could be anyone’s race. The top-two individuals from a year ago have moved onto greener pastures, meaning Tiffin’s James Ngandu is the top returner. Seeing that the senior has won all five meets in which he’s competed this year, he could be looking to make it six-of-six on the 2017 campaign. But the aforementioned Gidabuday (fourth in 2016) and Zach Panning of GVSU – who finished fifth last season – are also two names to keep an eye on. However, neither of them have competed the full season, which could be a cause for concern. Gidabuday has a plethora of teammates who have been exquisite this season, including South Central Regional Champ Lucio Ramirez, Elias Gedyon and Kale Adams. The same can be said of Panning’s teammates, especially Wuoi Mach. The senior hasn’t finished below fifth in any meet this season. A few of Colorado Mines’ men could run away with the title, as well, including Ricardo Ocampo – who led the team at the South Central Regionals – or Logan Ramlet – who was the team’s top finisher at the national meet last season. Chico State’s Kyle Medina is definitely a threat, as is American International’s Leakey Kipkosgei. Both finished in the top-15 a year ago at this meet. Western Oregon’s David Ribich could also make a splash. While he did not compete in this race a year ago, he’s put together a really solid senior campaign and is coming fresh off a West Region title. Also watch for Marcelo Laguera of CSU-Pueblo. Overshadowed by the dominance of Adams State and Colorado Mines in the RMAC and South Central Region, Laguera has had a nice season. Kendra Foley of GVSU destroyed the field last year, winning by 25 seconds. She isn’t back, having graduated, but a few of the top finishers from a year ago are back and are looking to take home some individual hardware. U-Mary’s Alexis Zeis was a runner-up a year ago, and that loss may have fueled her senior campaign, as she has gone undefeated in four meets this year. She won the Central Region individual championship by a whopping 17 seconds, so look for her to make some noise on Saturday. Also watch out for Caroline Kurgat from Alaska Anchorage. Finishing third a year ago, Kurgat has rattled off three-straight wins over her last three meets, including a West Region title in a loaded field. Other returnees from a year ago who have had solid campaigns in 2017 that could make a name for themselves this Saturday are Emilee Trost of Minnesota Duluth (fourth in 2016) and Colett Rampf of Saint Leo (14th in 2016). There will be some new challengers to the throne this year, too, though. Keep an eye on Mount Olive’s Leah Hanle, Hannah Wolkenhauer of Queens (N.C.), Walsh’s Sarah Berger, Hannah Dorman of Chico State and a pair of women from Cal Baptist in Anett Somogyi and Emeline Delanis. All six have competed well in difficult races at some point during the season, and could really step up their game to bring home an individual title.